ANAHEIM – For the second straight game, the Sharks fell into an early 2-0 hole. And for the second straight game they erased that deficit, only to lose on a late third period marker. Hampus Lindholm scored with 5:38 to go in regulation, pushing the Ducks to a 3-2 win over the Sharks at Honda Center on Friday night. Lindholm snapped a 2-2 tie when he found open ice at the top of the circle and buzzed a wrist shot past Martin Jones, for the defenseman’s first of the season. Anaheim improved to 5-0-1 in the last six head-to-head matchups between the Pacific Division rivals, and moved ahead of the Sharks by two points in the standings. The Sharks lost their second straight game, including a 4-2 defeat to Ottawa on Wednesday night at SAP Center. They have scored two or fewer goals in nine of their last 12 games, going 6-5-1 over that span. Rickard Rakell opened the scoring at 4:44. The forward found the rebound of a Shea Theodore shot after Marc-Edouard Vlasic failed to clear the zone for his 11th goal. Antonie Vermette increased the lead to 2-0, finishing off a rush at 15:06 when he slid the puck past Jones’ far side. San Jose got one back just before the intermission, though. One second after a power play had expired, Brent Burns hammered home a one-timer from the circle on a pass from Patrick Marleau with just six seconds left in the period, after Vlasic nicely kept the puck in at the offensive blue line. Burns has now scored one goal in each of the past three games, and has six in the last nine games overall. The Sharks pushed the pace early in the second period, but Jonathan Bernier made stops on Mikkel Boedker, Joonas Donskoi, Joe Pavelski and Melker Karlsson to keep the Ducks lead intact. That is, until Kevin Labanc knotted it at 2-2, finishing off a cross-ice pass by Logan Couture at 8:40 for the rookie’s third of the season. The Sharks had a great chance to take their first lead of the night early in the third period, but Joe Pavelski missed a wide open net less than three minutes into the final frame. 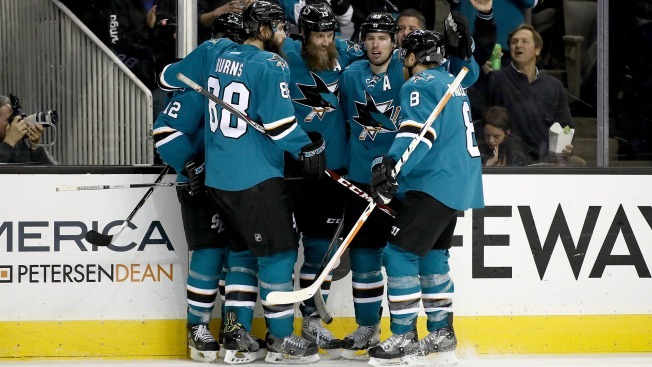 The Sharks and Ducks split the first two meetings of the season series. San Jose returns to Honda Center later this month on Dec. 27. The Sharks were officially 0-for-1 on the power play. They killed off all three Anaheim advantages, ending a three-game streak of one power play goal against. Starting for the 10th time in the last 11 games, Jones allowed three goals on 32 shots. He fell to 3-7-0 in his career against Anaheim. Bernier was playing for the first time since giving up eight goals to Calgary on Dec. 4. He made 22 saves to pick up the win. Defenseman David Schlemko missed his second straight game with a right ankle injury. Mirco Mueller was recalled on Friday morning, but did not play. Rakell returned from being out for the last two games with an upper body injury. The Sharks return home for the second of a back-to-back on Saturday against the Hurricanes, who claimed a 1-0 win in Carolina on Nov. 15. A four-game road trip begins in Toronto on Tuesday, Dec. 13.